Down time: Reliance Industries chairman Mukesh Ambani. Mumbai: India’s most valuable company, Reliance Industries Ltd (RIL) posted a 6.4% dip in net profit for the July-September quarter, hit by low refining margins, reduced exports and higher tax provisioning. The conglomerate said net sales rose 4.8% to Rs46,848 crore from Rs44,688 crore, the bulk of it contributed by the oil and gas segment. A poll of seven domestic and foreign brokerages by Mint had estimated a profit after tax of Rs3,758.76 crore and revenue of Rs45,827.25 crore, after factoring in subdued refining margins and the slower-than-expected ramp-up of gas production from RIL’s D6 block in the Krishna-Godavari (KG) basin. Analysts had predicted RIL’s gross refining margins (GRMs)—or earnings from turning crude oil into a variety of fuels—at $6.50 (Rs308.75) a barrel. RIL said it clocked GRMs of $6 a barrel for the quarter, below analyst predictions. “The results are broadly in line with our expectations at the Ebitda level but within that, we were expecting GRMs of $7.30 (per barrel). The positive surprise came from the petrochemical segment in which the company has margins of 16.5% while we expected something around 12.5%," said Deepak Pareek, sector analyst with Mumbai-based brokerage Angel Broking Ltd. Ebitda or earnings before interest, taxes, depreciation and amortization is a measure of operating profit. “RPL may have had some teething troubles in terms of refinery stabilization but profitability should improve going forward," said Pareek. 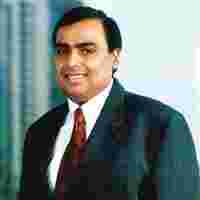 Reliance Petroleum Ltd or RPL, now fully absorbed by RIL, commissioned a 580,000 barrel a day refinery in December in Jamnagar, next to RIL’s existing and older 660,000 barrel a day unit, making for the world’s biggest refining hub in a single location. A company spokesperson declined to give details of RPL’s contribution to RIL’s earnings after the amalgamation and explained that the spike in other income was on account of improved interest income earned by the company on higher cash and cash equivalents. Exports decreased 26% to Rs43,035 crore for the first six months of the current fiscal, according to a company statement. RIL more than doubled current tax provisioning for the quarter to Rs800 crore from Rs344 crore. The oversupply in the market has not deterred the company from planning an expansion of its new refinery. RIL plans to bolster the refining capacity of its new Jamnagar facility by nearly a quarter and raise it to 720,000 barrels a day. RIL is not the only one adding refining capacity. About six million barrels a day of such capacity will come on stream globally by 2015, creating a surplus of as much as five million barrels a day by 2012, the Organization of Petroleum Exporting Countries said 8 July in its World Oil Outlook report. The past few weeks have seen a spate of announcements by RIL that sought to boost investor sentiment. In October, the company decided to dole out free shares, one for each held, to its shareholders—after a gap of 12 years—and a dividend of Rs13 a share for 2008-09. Chairman Ambani also took a pay cut of 66%, setting a “personal example of moderation"—his pay was cut to Rs15 crore for 2008-09 from Rs44 crore in the previous year. Broken down by segment, petrochemicals has seen a decline in revenue and a rise in profit and refining a rise in revenue and drop in profit as RPL would have added to revenue. Both revenue and profit have increased significantly in the oil and gas segments. The increase in the oil and gas category is driven by the sale of gas from RIL’s moneyspinning KG D6 field and is likely to drive the company’s financials in the future as well. Much, however, hangs on the resolution of the dispute between RIL and Reliance Natural Resources Ltd (RNRL), promoted by Mukesh Ambani’s estranged younger brother Anil Ambani, that is currently being heard in the Supreme Court. RNRL is demanding 28 million standard cu m. of gas a day (mscmd) of gas at a 44% cheaper price than that mandated by the government, citing a 2005 family demerger pact whose validity RIL has questioned. About 40 mscmd—sold to government-specified buyers at government-set prices in pre-determined quantities—is being produced at the block and the output is expected to peak at 80 mscmd by the end of 2009. On Tuesday, an empowered group of ministers had fixed users for another 50 mscmd of KG gas, paving the way for RIL to quickly ramp up production. Citibank analysts Rahul Singh and Saurabh Handa, who have a “hold" rating on the stock, on 8 October spelt out that a “more constructive view on RIL would be contingent" on three critical issues—“marked improvement in refining outlook, settling gas dispute and stock (price) correction". RIL shares closed at Rs2,003.85 each, down 1.56%, on Thursday on the Bombay Stock Exchange, moving in tandem with the bellwether equity index, the Sensex, which declined 1.42%. The results were announced after the markets closed.